Inconvenience isn’t something we celebrate in our culture. When was the last time you bought a product that promised to be inconvenient? We want faster, smarter, sleeker, better. We are creatures of comfort, and we purr happily when we stroke our egos. We believe convenience is a necessity of modern living. I need my calendar, my contacts, my deadlines and distractions right at my fingertips. Excuse me while I sync my devices so everything is up to speed. But here we go again with that counter-cultural call of Christ. 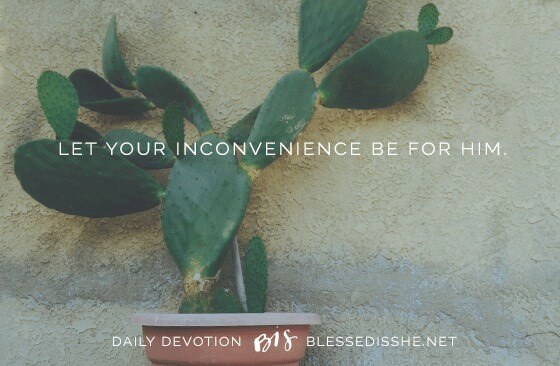 See today’s First Reading: that righteous one who is inconvenient to the rest. Who really wants to change their ways to be holy and blameless in the sight of God? Except here’s the rub. All this seeking to do the will of God, all this obedience we’re supposed to be about as people of faith? It was inconvenient for Christ, too. See today’s Gospel. Jesus can’t travel freely because His enemies want to kill Him. Inconvenient. He has to keep preaching the same message because people misunderstand. Inconvenient. Authorities seek to arrest and kill Him. Super inconvenient. But Jesus keeps on with His inconvenient ways because they are God’s ways. Holy, righteous, and true. This is Lent’s reminder, too. Discipleship is not meant to be comfortable and convenient. It is meant to draw us closer to Christ. So when you turn down that glass of wine or piece of cake or meat on Fridays, let your inconvenience be for Him. When you turn the light back on to pray before bed, or when you rearrange your schedule to get to Mass, let your inconvenience be for Him. When you squeeze your budget to give to the poor, or when you stop from splurging on yourself so you can share with others, let all your inconvenience be for Him. Let us be inconvenient Christians. Let our words ring true and our trust run deep. Let us be called children of an inconvenient God.